Preservation Tech Trish Smith, L, and Intern Kendy Altizer, R.
After graduating from college with a dual degree in History and Anthropology, I spent a number of years working in Cultural Resource Management in a variety of capacities in several different states. My focus was prehistoric archaeology and I spent many a happy day out on survey in remote areas of the United States documenting prehistoric and historic resources. I eventually began spending more and more time in the office writing reports and learning the business side of Cultural Resource Management. While I enjoyed the consulting aspect of archaeology, I found myself wanting a different challenge but I wasn’t really sure what that challenge might entail. 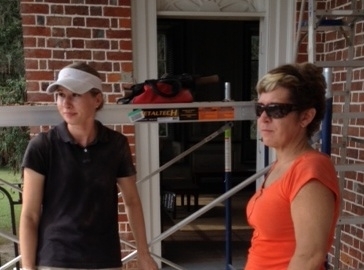 Intern Kendy Altizer works with Preservation Tech Trish Smith on the portico. I visited Drayton Hall for the first time during a vacation to the southeast in 2011 and was really inspired by the feeling of the grounds and the way in which the property has been preserved. During a stroll down by the Ashley River, reflecting on my career path and what I hoped to accomplish, it occurred to me that I was not living up to my potential as an archaeologist and it was time to make the leap and go back to graduate school. Drayton Hall provided the catalyst to see historic preservation in a different way than private consulting often allows. For the first time in many years I found myself genuinely excited about the idea of practicing archaeology in a different capacity. I realized there was so much more I could be doing with my experience; I just needed more education. For years I have wanted to explore opportunities in the southeast and, after seeing Drayton Hall and spending time in Charleston, I thought the low country might be the perfect place to expand my education. 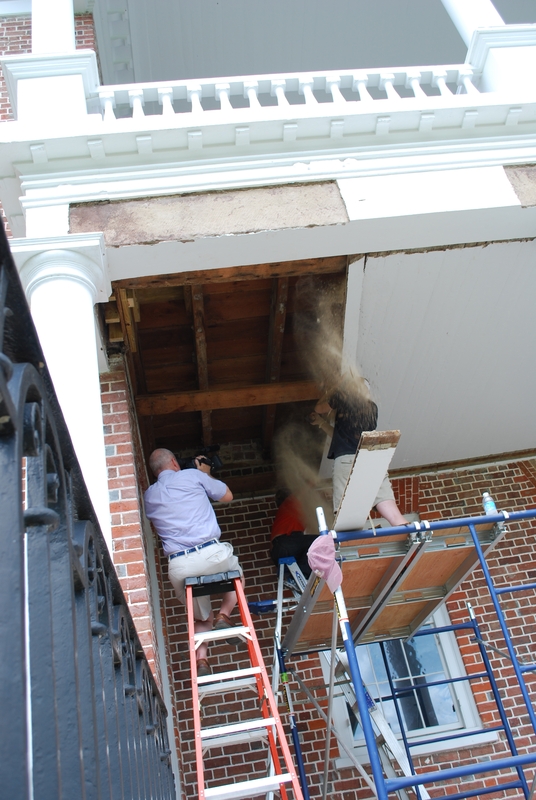 Preservation Tech Trish Smith is covered by historical debris as she pulls down one of the ceiling boards from the portico. To her left is videographer Jay Millard. Less than a year later, here I am in Clemson’s Graduate Program for Historic Preservation in beautiful Charleston, South Carolina. The highlight of my first semester in the program has been volunteering at Drayton Hall and working with Trish Smith. I had no idea, when I came in to help out in the archives a few Fridays ago, that I would be allowed the opportunity to get my hands dirty. 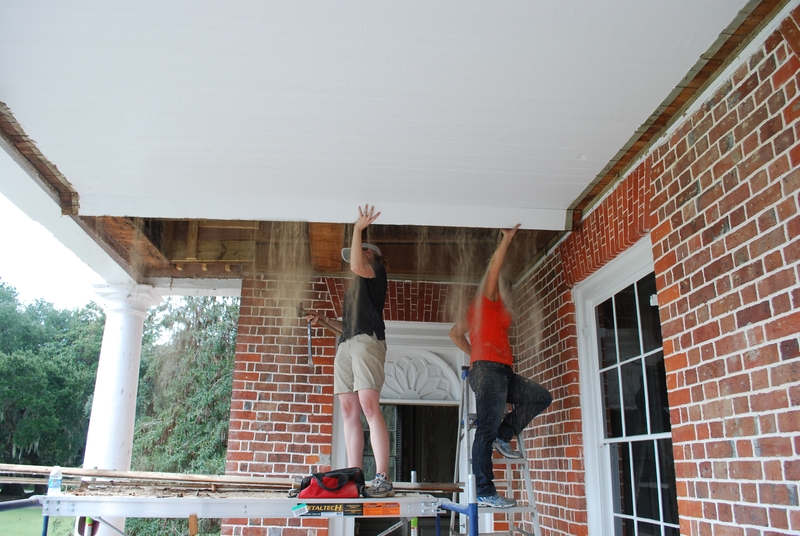 When I came in for work that morning, Trish asked me if I would like to help disassemble the portico ceiling on the front porch of Drayton Hall. I was amazed! This was an aspiring preservationist’s dream! We spent the better part of the day meticulously disassembling the portico ceiling board by board. Each board was mapped on a simple drawing and given a number for re-assembly at a later date. All boards were flagged and placed in the basement for safe keeping. Each board removed from the ceiling was also accompanied by a good amount of historic dust and dirt, which of course ended up all over us. This was truly one of the best experiences I have ever had and I hope to continue to be a part of this project in the future.